Last Wednesday, we formally launched the X-Ray project at London's Horse Hospital. It was an amazing event. Stephen introduced the project by telling the story of the X-Ray records in the Soviet Union and the cultural background that brought them about. After the interval. Aleks Kolkowski gave a brief history of home-made recordings on plastic with various weird and wonderful examples from his collection. Then, as the piece-de-resistance, he cut a new X-Ray record live from a specially written and recorded song by The Real Tuesday Weld: 'Skeletons in Waiting". We tried to replicate the process as nearly as possible to the way it would have been carried out originally - copying music from either a gramophone record or a new master. The song "Skeletons is Waiting' was recorded in the studio and cut onto a dub plate (a one-off vinyl master record). At the event, we played the dub plate on a 1950s gramophone to demonstrate its sound and then Aleks used a recording lathe amalgamated from various original pieces of 1930s - 1950s equipment (see below), to copy and write the music onto a new X-Ray film obtained from the US. If you were there, I am sure you will agree it was super exciting and funny. First Aleks cut the square X-Ray into a circle and made a spindle hole, albeit with a hole punch rather than using the traditional method of rocketing a cigarette and burning a hole thought the plastic.. 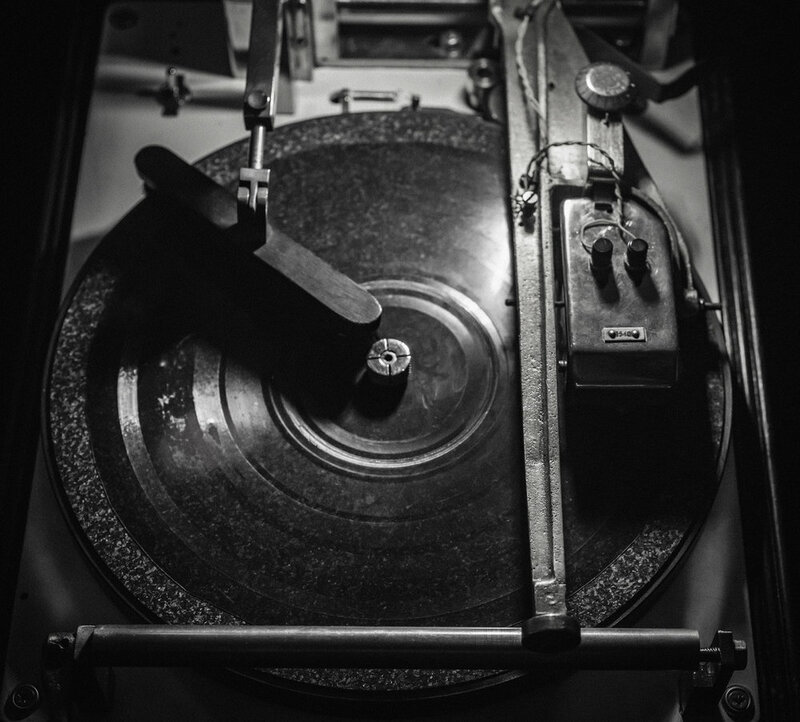 The X-Ray film was placed on the lathe and the audio from the gramophone sent to the lathe head. There was much tension in the air as the lathe began to cut its spiral groove. We had to do the whole thing twice as only one side of the X-Ray can properly take the groove and we started with the wrong one. The finished Bone was then played back on the gramophone to great cheering (and relief) from those present. It sounded suitably 'bonelike' and scratchy and took quite some effort to keep on the turntable. Check out the sound file to hear The Real Tuesday Weld on X-Ray. This was all useful as a demonstration and experiment because it showed how difficult and laborious the process of making such records actually is. But now having learned how, we will be repeating the experiment with refinements at future live events and for our upcoming radio documentary.